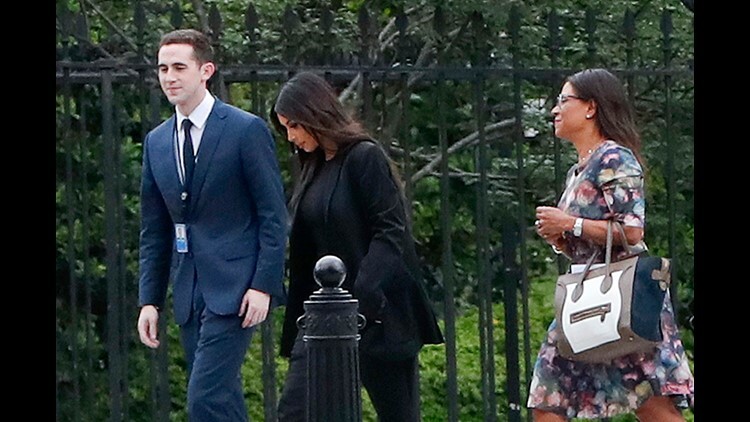 Kim Kardashian, center, arrives with her attorney Shawn Chapman Holley at the security entrance of the White House in Washington, Wednesday, May 30. Kim Kardashian West made waves at the White House Wednesday. The reality TV star personally met with President Trump, who tweeted out a smiling photo with Kardashian West in the Oval Office. "Great meeting with @KimKardashian today, talked about prison reform and sentencing," wrote the president. In their version of Twitter diplomacy, she later tweeted her thanks to the president. Dressed in all black with bright yellow pumps, Kardashian West arrived at a security entrance with her lawyer, attorney Shawn Chapman Holley, late Wednesday afternoon. During the meeting, which was set to include senior advisor Jared Kushner, Kardashian West advocated for the release of 62-year-old Alice Marie Johnson, who is serving a life sentence for a first-time, nonviolent drug offense, according to her post-meeting tweet. She has shared her support of Johnson on social media, calling the sentencing "so unfair" on Twitter in October. She thanked the president and expressed hope he would "grant clemency to Ms. Alice Marie Johnson" after they met. She added in a second tweet: "We are optimistic about Mrs. Johnson's future and hopeful that she — and so many like her — will get a second chance at life." She continued her optimism in an interview with Mic Thursday, saying the president "really spent the time to listen to our case... I'm very hopeful." She added her reasons why she believes Johnson is a good candidate for clemency, citing her good behavior in prison and a supportive family and job waiting for her back home. She also commented on how Trump seemed during the meeting. "The president seems to have a passion for everything that Jared has been trying to do," she said. "And that just makes me happy that that conversation is moving forward." Earlier Wednesday, Kardashian West tweeted a birthday message for Johnson. "Happy Birthday Alice Marie Johnson," she wrote. "Today is for you." Johnson's story went viral thanks in part to a Mic video interview that reached more than 4.1 million views. A change.org petition asking President Trump to grant Johnson clemency has also almost reached its goal of 300,000 supporter signatures as of Wednesday. Kushner has focused on prison reform since joining the administration. He was involved with the First Step Act, which plans to expand programs for prisoners and allow for more home confinement. The act was approved by the House of Representatives earlier this month. A pardon or commutation for Johnson is unlikely today, though the president has not made a decision. Kardashian West supported Hillary Clinton during the 2016 presidential race, but recently, her husband Kanye West has tweeted his support for Trump. The rapper met with Trump in December 2016 during a visit to the Trump Tower in New York. Trump posed with West after their meeting, calling him a "good man" with whom he talked about "life." Kanye had previously declared his allegiance to Trump onstage the month prior. Ten years ago this October, a little reality series called 'Keeping Up with the Kardashians' debuted. The E! program centered around burgeoning celebrity Kim Kardashian, top right, and her wild family. Left to right upper: Robert (Rob) Kardashian Jr., Khloé Kardashian, Kris Jenner and Caitlyn Jenner (then known as Bruce). Left to right bottom: Kylie Jenner, Kendall Jenner and Kourtney Kardashian. Khloé, Kim, Kourtney and Rob (not pictured) are the children of attorney Robert Kardashian, a member of the defense team for O.J. Simpson during his 1995 trial. Kim, in Monte Carlo in 2009, previously helped celebrities like Paris Hilton clean out their closets. On Aug. 20, 2011, Kim wed NBA player Kris Humphries in a televised ceremony, but didn't quite make it to til death do them part. She filed for divorce after just 72 days of marriage. The series also offers glimpses of Kim's relationship with Kanye West. Kim and Kanye welcomed their daughter North, seen in 2015, two years prior. The parents tied the knot in an Italian ceremony in 2014, for which preparations were televised. A lover of selfies, Kim released a collection of her snaps in the coffee table book 'Selfish,' in 2015. Kim, shown in September 2017, sported platinum locks during New York Fashion Week. Kourtney, the eldest of her siblings, poses at the Aces & Angels Celebrity Poker Tournament in 2009. Kourtney and her sisters, Kim and Khloé, released a novel titled 'Dollhouse' in 2011. The cameras captured the cast's relationships, including the highs and lows of Kourtney's romance with the father of her three children, Scott Disick. Kourtney, with her oldest child Mason Dash Disick, born in 2009, attend the 'Thomas & Friends: King of the Railway' L.A. premiere in 2013. Kourtney and Scott Disick, in Las Vegas in 2015 have three children together: Mason, Penelope Scotland Disick and Reign Aston Disick. Kourtney and Scott ended things in 2015. Kourtney, photographed at a premiere of 'The Promise' in April, has recently been romantically linked to model Younes Bendjima. On E! 's anniversary special which aired Sept. 24, Kourtney and Disick confirmed they were not together but do co-parent. The struggles Disick, seated next to Humphries in 2011, have been documented on the series. In seemingly happy times, Disick and Kourtney celebrated New Year's Eve at the Paris Las Vegas on Dec. 31, 2011. The former couple attended an event in 2014 in Bridgehampton, New York while Kourtney was pregnant with their youngest, Reign. Disick, who was spotted cozying up to model Sofia Richie in September, partied in Las Vegas in July. Khloé is the younger sister of Kim and Kourtney. She married Lamar Odom in 2009, after a very brief courtship. They two, pictured at the 2010 Teen Choice Awards, officially divorced in 2016. Khloé co-hosted 'The X Factor' with Mario Lopez in 2012. Khloé released her book, 'Strong Looks Better Naked,' in 2015. Khloé attended a launch party for her fashion brand, Good American, on Oct. 18, 2016 in Los Angeles. Kris Jenner's only son, Rob, with Reggie Bush and Kim, previously dated 'The Real' co-host Adrienne Bailon. With partner Cheryl Burke, Rob placed second on 'Dancing with the Stars' in 2011. Donning a suit, Rob attended the 2012 Miss USA pageant in Las Vegas. In 2013, he appeared again in Vegas at DAYLIGHT Beach Club. Rob got engaged to model/entrepreneur Blac Chyna got engaged in 2016. Though they've since had a messy split, the two share a daughter, Dream Renée Kardashian, who arrived in 2016. Kendall, the eldest of Kris and Caitlyn's daughters, poses with her sisters, Kim, Kylie and Kourtney at the 2011 Teen Choice Awards. She modeled lingerie in the Victoria's Secret Fashion Show on Nov. 10, 2015 in New York City. The face of Estée Lauder and La Perla strutted the catwalks during September's New York Fashion Week. Kendall walked in the Alexander Wang show on Sept. 9, 2017. Kylie, seen with Kendall in 2011, is the youngest of Kris and Caitlyn's children. Kylie, with Jaden Smith, attended the L.A. premiere of 'Ender's Game' in 2013. Kylie, seen with Kendall in 2014, launched Kylie Cosmetics two years later. Kylie previously dated rapper Tyga who shares a son with Rob's ex, Blac Chyna. In Sept. 2017, outlets reported Kylie, at the Met Gala in May, was expecting her first child. Momager extraordinaire Kris hangs with her daughters, Kourtney, Kim and Khloé at an event in 2009. She released a memoir, 'Kris Jenner . . . And All Things Kardashian' in 2011. She hosted a short-lived talk show called 'Kris' in 2013, on which her son-in-law, Kanye, was a guest. The famous mom released a cookbook titled 'In the Kitchen with Kris: A Kollection of Kardashian-Jenner Family Favorites' in 2014. Kris, who will celebrate her 62nd birthday in November, attended the Grammys in February. Caitlyn, who wed Kris in 1991, unveiled her new look on a 'Vanity Fair' cover shot by Annie Leibovitz in 2015. Caitlyn accepted the Arthur Ashe Courage Award during the ESPYS on July 15, 2015. Caitlyn documented her transition on two seasons of the E! reality series 'I Am Cait,' which premiered in 2015. Kris filed for divorce from Caitlyn in 2014, but the former pair appeared friendly at a Yeezy fashion show on Feb. 11, 2016. Caitlyn posed with her memoir, 'The Secrets of My Life,' released in 2017 at a Barnes & Noble on April 26.